The content of the morning looked promising, with the session called “transforming your church building for mission”. Sitting in the audience with numerous other PCC members from a variety of parishes I awaited his take on this subject with interest. He began by looking at the concept of what, actually, is a church building? Various ideas were put forward: was it “an art historical document?”, “a machine for worshipping in” or “a shared story”? Moving through these diverse concepts he never lost sight of the primary purpose of our churches: to be a local centre of mission and ministry which must serve us as the local community. He went on to explain some of the vaguer mysteries of the ecclesiastical exemption and faculty jurisdiction, explaining that whilst all our churches had a primary purpose (to enable mission) most of them (certainly in this Diocese) were also important historical buildings. As we all know, therein lies the paradox: of enabling us as faithful Christians to use our church buildings better whilst understanding that it can feel like walking on a tightrope when changing their layout is being considered. A particular quote he used, from a certain Mr Winston Churchill, stuck with me: “We shape our buildings, and afterwards our buildings shape us.” Nigel’s idea that it’s a ‘conversation’ between us and our churches was quite refreshing, not that they are our enemy but most certainly can be sensitively and practically adapted to mirror more clearly where we are as Christians in what sometimes can feel like a nation out of love with its national Church. 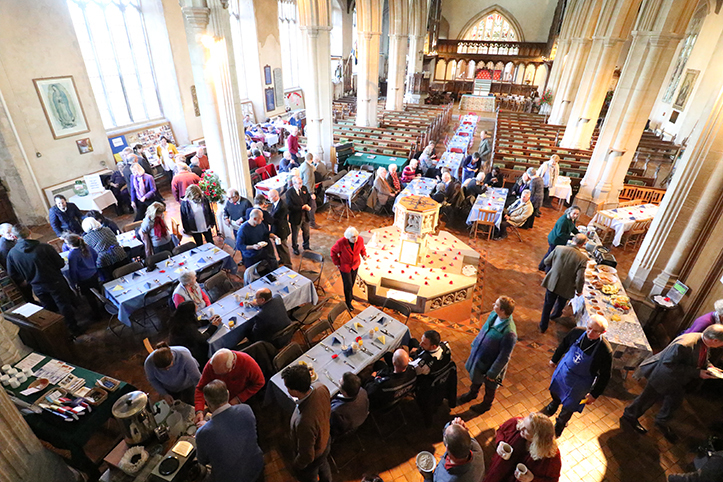 After a break and a chance to chat with members of other churches, most of whom face the same questions in how to make their churches work better, we looked at practical examples of adapting the buildings and the considerations that we needed to take into account. I will leave you with a direct quote from Nigel, one that seems to identify quite clearly his approach to dealing with churches: “This is not a building project ... but a mission project that involves a building.” Wonderfully refreshing and led by a man with a real understanding of what it’s like to care for an historic church, I cannot recommend his approach highly enough.